Bakers Loft in Grasmere, near Ambleside, Cumbria sleeps 4 people. Bakers Loft near Ambleside is an apartment which is positioned in the heart of Grasmere village with a stunning backdrop of the surrounding crags and fells. Bakers Loft is situated on the first floor above a tea room and has your comfort in mind. With bright and airy rooms, and a calm and neutral décor, it is furnished and equipped with a quality feel throughout. 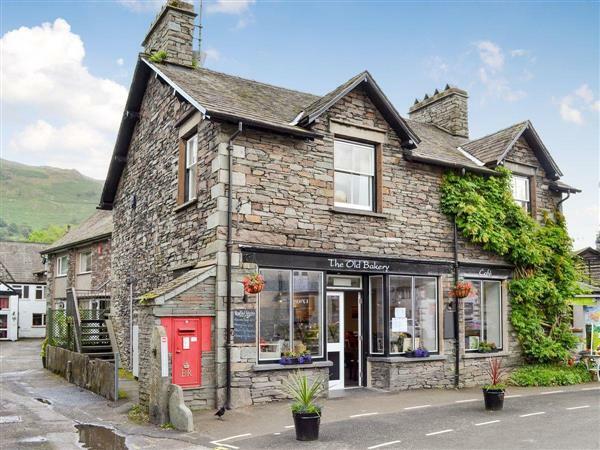 Grasmere has an abundance of interesting shops and tea rooms and culinary experiences from around the world can be sampled in the restaurants, or you can sit and relax in any of the wide range of bars. This traditional Lakeland style property is just a short drive for those looking to walk some of the most well-known central fells. There are many easier and gentler paths with stunning scenic views that can be found too, including the nearby Grasmere and Rydal Water Circuit. Traditional events such as the Rushbearing and Grasmere Sports and Show still take place during the summer months, whilst the Wordsworth connection continues with St Oswald’s churchyard, where beneath the yews, the poet and his family’s graves can be found, or perhaps visit Dove Cottage and Rydal Mount. Leave the car, and take the open top bus that offers unlimited stops along its route, a perfect and enjoyable way to see the sights. The shop and pub are 200 yards from Bakers Loft near Ambleside, with the restaurant 20 yards from Bakers Loft. First Floor: Bakers Loft near Ambleside has 16 external steps to the entrance. Kitchen: Galley style with electric cooker, fridge/freezer and washer/dryer. Electric central heating, electricity, bed linen, towels and Wi-Fi included. 2 travel cots and highchair. Private parking for 1 car (75 yards away); unloading at the door. No smoking. Holidays at Bakers Loft run from Friday to Friday. Pets allowed at Bakers Loft. For a better idea of where Bakers Loft is, you can see Bakers Loft on the map below. Bakers Loft is in Cumbria; should you be on the lookout for a special offer, you can find all the special offers in Cumbria. It's always worth checking to see what is on offer at the moment. Do you want to holiday near Bakers Loft (UK1133), you can see other cottages within 25 miles of Bakers Loft; have a look to find your perfect holiday location.